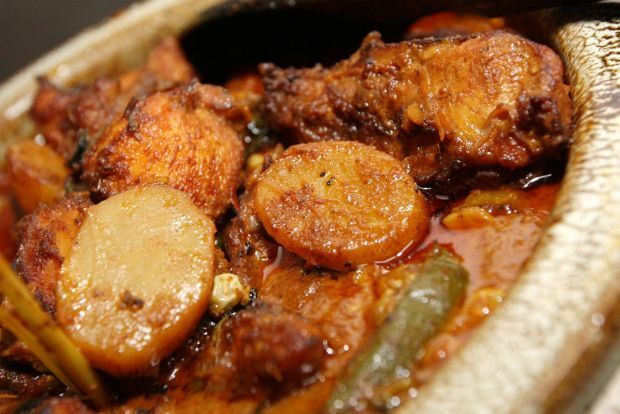 THE popular nasi kandar by guest chef Abdul Knchi Mydin who hails from Penang, is back for the second time at Maya Brasserie for this year’s Ramadan buffet promotion. Abdul, a retired chef, along with his son Norhanif, 42, will be back in the kitchen at Hotel Maya due to popular demand, whipping up the former’s own recipe for the well-known dish. 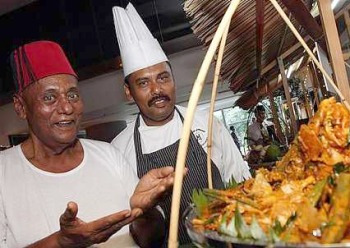 Signature dish: Chef Abdul (left) and his son Norhanif showing the Pak Mydin’s Red Snapper Fish Head Curry”. “The recipe I use is my own. I came up with it 28 years ago when I was still working as a full-time chef in hotels,” Abdul said. Having worked in the food industry for decades, Abdul said that it takes about three hours to prepare everything including the accompanying dishes for the nasi kandar. “In the olden days, the nasi kandar will be placed in a large copper pot while the dishes arranged beside each other on a large tray. While this has changed, one thing that still has not is the way nasi kandar is made and it is by hand,” he said. Abdul’s father was also a cook and sold nasi kandar daily from a stall. “Everything would be sold out within one and a half hours. I used to watch him prepare and cook the dishes,” the 72-year-old recalled. Among the must-try side dishes for the nasi kandar recommended by Abdul is the Ayam Masak Madu, Ketam Masak Masala and Daging Masak Hitam. “My specialty however is the Kari Kepala Ikan Merah Pak Mydin and it goes very well with the briyani rice,” Abdul said, adding that a good fish head curry is one that you will never get bored of eating. 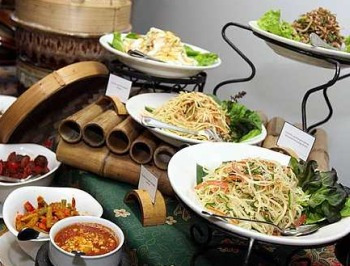 Hotel Maya Kuala Lumpur Malay senior sous chef Hasbullah Sabani said the buffet’s other offerings include cuisine from Negri Sembilan, Malacca, Pahang and Perak. “Negri Sembilan food is usually rich and a bit spicy, Malacca is known for its Asam Pedas dishes, Pahang has Pindang cuisine that usually has a lot of light gravy and very little seasonings to enhance the natural flavours of the food while Perak is known for their Rendang Tok,” he explained. 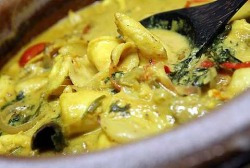 Apart from that, there will also be some live cooking stations, one of them featuring another of Abdul’s recipes for seafood pasembor, while others include a “goreng” (fried) stall for various meat and seafood items, roti canai and ais kacang. Not too creamy: Squid cooked in spices has a lighter flavour. “This year, we are introducing an improved version of the deep-fried items such as bananas, tapioca, cempedak (jackfruit), yam and more. “These will be fried in our new secret recipe batter that will stay crunchy for awhile, unlike others that go soft after some time,” Hasbullah said. He said that this was courtesy of the training they had done last year with a nyonya kuih expert. Another returning popular dish on the buffet this year is the Serawa durian, a sweet dessert made using the flesh of the king of fruits and is accompanied by round, bite-sized pulut cakes. Spoilt for choice: Apart from the popular nasi kandar, guests who break their fast at Maya Brasserie this year will also enjoy a range of kampung-style food including the various kerabu dishes. Hasbullah added that there will be seven menus, each with more than 30 items excluding the live stations, on a daily rotation basis for this year’s Ramadan buffet that begins on Aug 1 until Aug 29. The price per adult is RM90 while children between five and 12 years old is RM55. Maya Brasserie can seat about 200 diners. Private function rooms are also available with banquet menus priced from RM90 to RM120 per adult. All prices are subject to 10% service charge and 5% government tax.